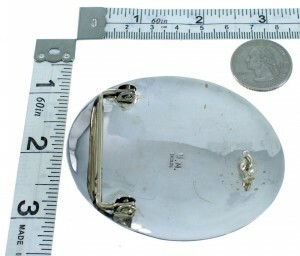 Belt buckle measures approximately 2-1/2" long, 3" at widest, and will fit a belt that is up to 1-1/2" wide. The belt buckle weighs 51 grams. 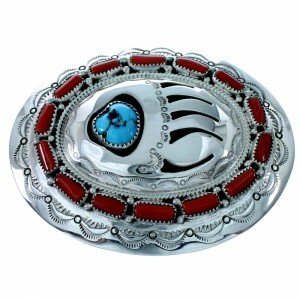 Take advantage of the great price on this amazing belt buckle! This piece of Native American jewelry is Navajo hand crafted by artist Wilbert Muskett Sr., out of genuine sterling silver, along with a real Turquoise stone and Corals. ONE Turquoise stone is gently placed in a shadow box bezel setting, while hand cut silver work creates a beautiful bear paw design. A total of FOURTEEN Corals surround the bear paw design for a fabulous look. Mini silver beads, twisted silver, and imprinted designs can be seen highlighting the buckle for a dazzling finish. In Native American beliefs, the bear paw is usually considered a way to call for the power of the animal spirit, or as an indication of the presence of the spirit. It is a symbol that represents inner strength. The belt buckle is stamped sterling and hallmarked.